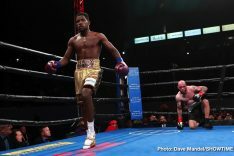 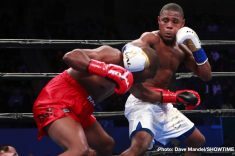 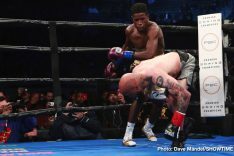 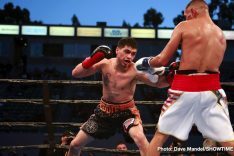 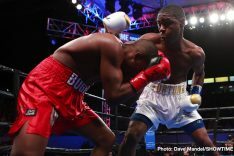 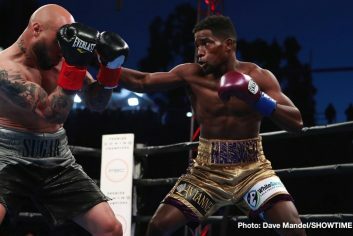 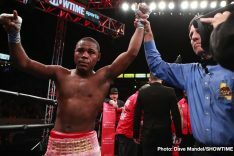 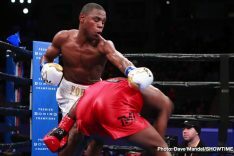 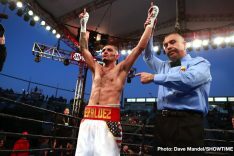 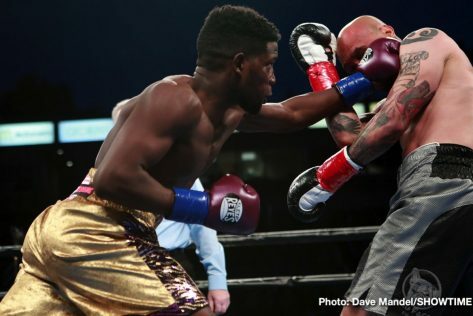 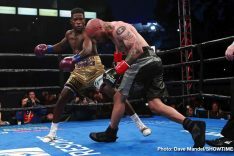 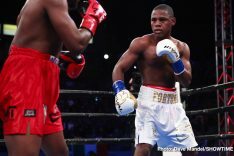 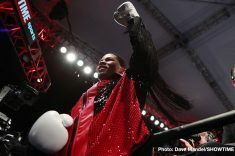 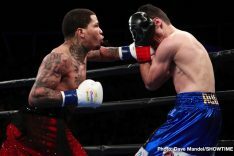 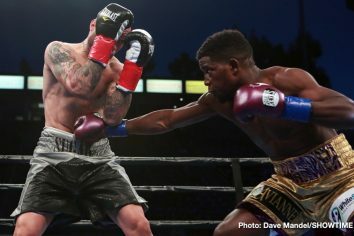 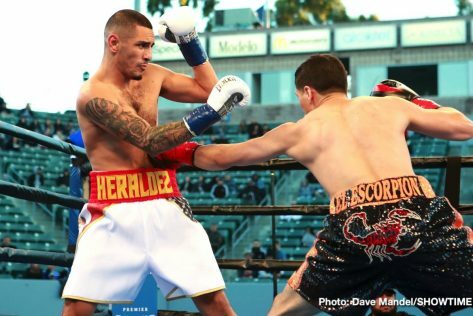 By Dan Ambrose: WBA Super World super featherweight champion Gervonta ‘Tank’ Davis (21-0, 20 Kos) obliterated former WBC super bantamweight champion Hugo Ruiz (39-5, 33 KOs) by a first round knockout on Saturday night on SHOWTIME Championship Boxing from the Dignity Health Sports Park, in Carson, California. 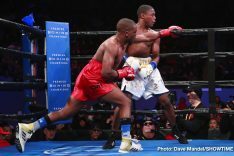 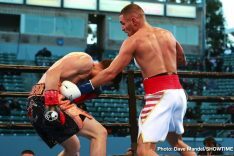 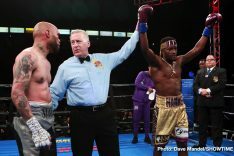 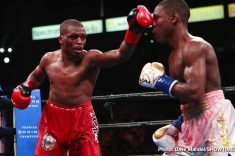 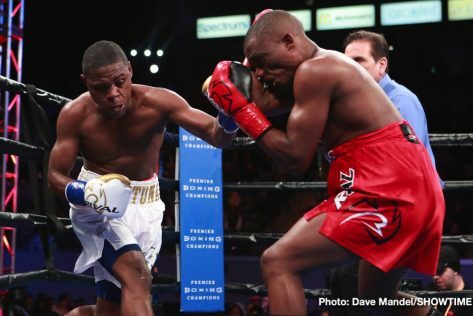 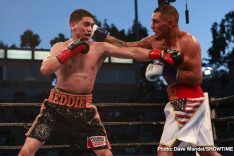 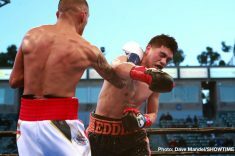 Davis stalked the timid-looking Ruiz around the ring until trapping him against the ropes, and dropping him with a scorching hook to the head. 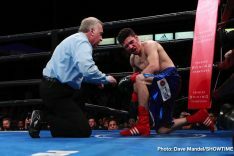 Ruiz got up on shaky legs, but the referee Jack Reiss opted to stop the fight after observing how hurt Ruiz was. 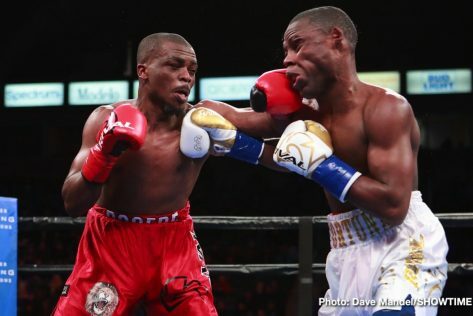 The official time of the stoppage was at 2:59 of round one. 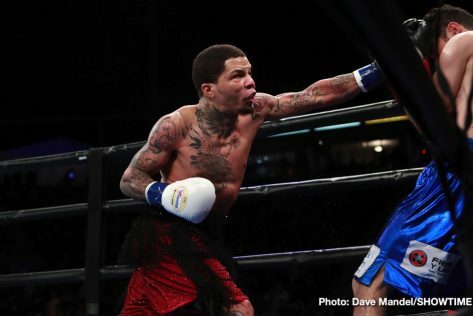 The fight was over so quickly that the 24-year-old Gervonta didn’t even get a chance to get warmed up properly. 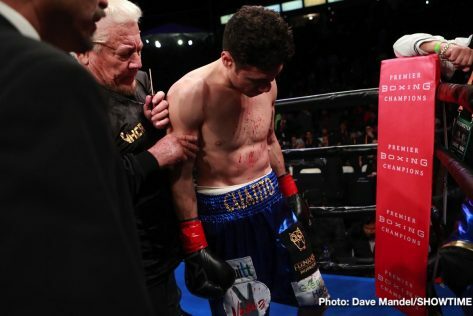 He wasn’t a real test for him. 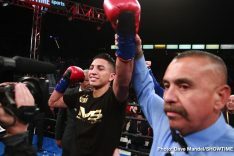 That’s not to say that Davis’ previously scheduled opponent Abner Mares would have done any better than Ruiz. 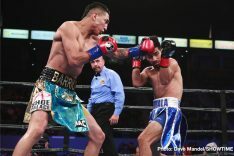 Defensively, Mares might have been able to survive a little longer than Ruiz did tonight, but with the way that Gervonta was punching, he wouldn’t have lasted long. 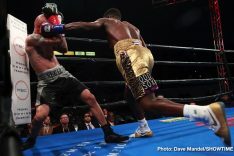 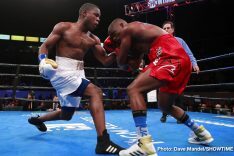 Davis is on another level right now in terms of punching power. 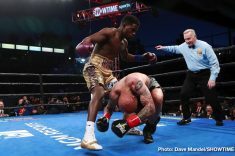 At the start of the fight, Davis came flying out of the blocks, landing jabs and staying on top of the tall, spender 5’9 1/2″ Ruiz. 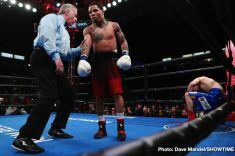 Gervonta’s jabs were landing with a lot of power to the midsection of Ruiz. 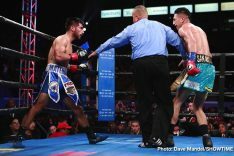 Ruiz clearly didn’t like getting hit with those jabs, as he backed up and gave ground. 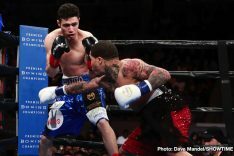 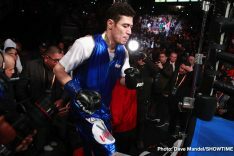 Ruiz didn’t want to let his own shots go for some reason, even though he had the hand speed, size and the power to get Gervonta’s attention if he would have thrown something. 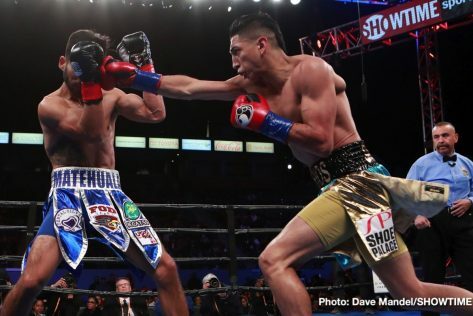 It appeared that Ruiz didn’t want to take any risks of getting hit with one of Davis’s powerful counter punches, so he chose to back up and try and avoid him. 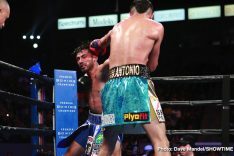 That was not the right move for him to make, because he wasn’t doing anything to keep him off. 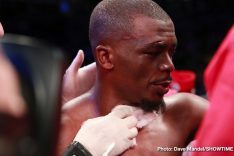 Davis caught up with Ruiz and busted his nose with a hook that he got everything on. 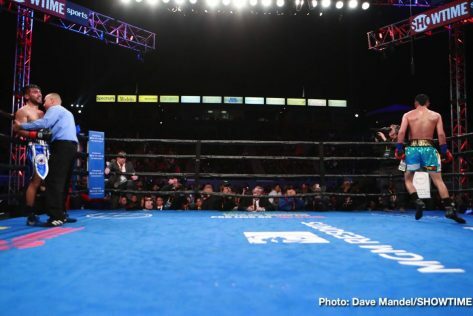 Ruiz dropped like he’d been shot by cannon. 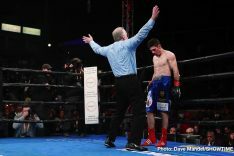 Ruiz then rose to his feet on shaky leg. 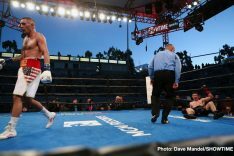 The referee Jack Reiss then asked Ruiz if he wanted to keep fighting. 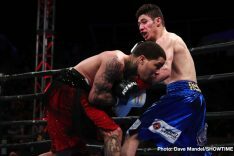 Reiss opted to stop the fight after seeing how hurt he was. 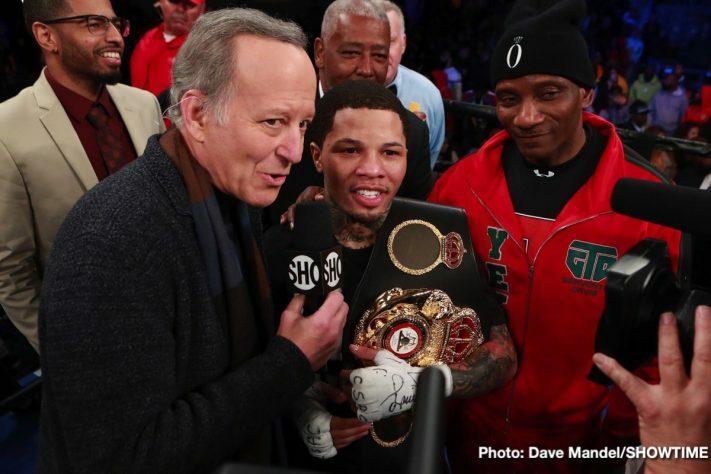 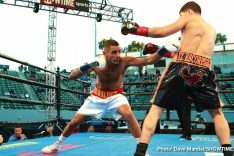 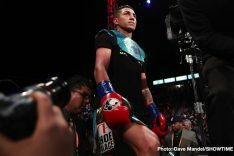 The bad news about Gervonta’s fast knockout of Ruiz is he probably scared away Top Rank Boxing from letting their star lightweight Vasyl Lomachenko or unbeaten contender Teofimo Lopez fight him. 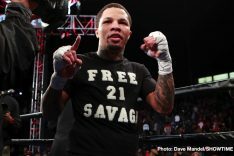 Gervonta is like a small Mike Tyson, and he’s too dangerous for Top Rank to let him anywhere near Lomachenko or Lopez right now. 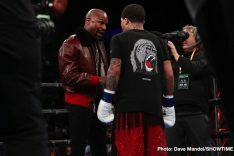 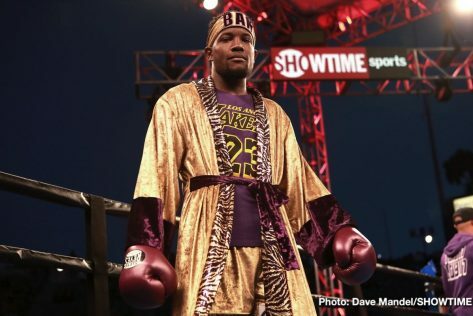 Top Rank promoter Bob Arum can continue to compare Lomachenko to the late great Muhammad Ali all he wants, but the fact of the matter is, he’s going to have problems if he takes on Gervonta Davis right now.